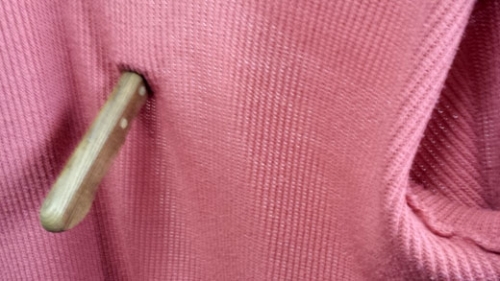 SPECIAL - Knife thru Everything - Push a knife thru paper, card or clothing a leave it unharmed! Only One Available! Once it's gone it's gone! An cutting edge illusion that will have your audience on a knife edge! A kitchen carving knife is shown and then jabbed through a spectators coat! Just for good measure the performed pulls the knife down the coat, a move that should leave it ripped. The coat is held in the air. 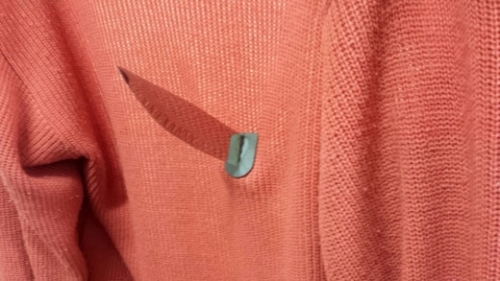 the knife is clearly stabbed through the coat. The knife is then removed and the coat is returned unharmed! The effect on the audience - and the poor owner of the coat - cannot be underestimated. Presented well this can be the highlight of any magician's show. Ideal for Assemblies - Imagine the children's reaction as you push a knife through the head teacher's coat! Knife is safe to use - no danger of cuts! This is a professional level prop and routine you're audience will love you performing. Buy the trick and enjoy using it! You will receive: x1 gimmicked knife, x1 standard duplicate knife and written instructions. Wonder Hanky - Vanish small items with no sleight of hand. Incredibly useful prop. 101 different illustrations possible - including Forgiveness, Money and the Kingdom. 4 Square Blendo - 24 Inch - Silks magically blend together - Team work, different gifts, body of Christ. SPECIAL - Gold Penetrating Block - ONE ONLY - LARGE - A Wooden Block Thru a Steel Plate. Barrier of Sin. Easter. Silk thru Phone by Jeimin Lee - VALUE - Impossible & Incredibly Visual magic.